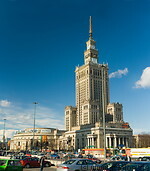 The Palace of Culture and Science (Palac Kultury i Nauki, aka PKIN ) was built between 1952 and 1955 according to a Soviet design and almost entirely by workers from the Soviet Union, as a gift from the people of the Soviet Union to the people of Warsaw. The building is 231 m tall and has a spire of 43 m. It has 3288 rooms on 42 floors for a total area of 123000 sq m, and contains cinemas, theatres, museums, offices, bookshops and a large conference hall for 3000 people. Its architecture is based on the Soviet style of that time, but also incorporates many genuinely Polish details. The monumental walls are headed with pieces of masonry copied from renaissance houses and palaces of Kraków and Zamosc.